Environmentalists and academics cautiously welcomed the likely return of diesel passenger cars, but a luxury-car dealer said it would be fortunate if his company could find a model that matched the new emissions standard by the end of this year. Chong Got, managing director of Audi’s distributor, Premium Motors, said Audi’s factory in Europe would produce 20 diesel engine models this year meeting the Euro-V diesel emissions standard. 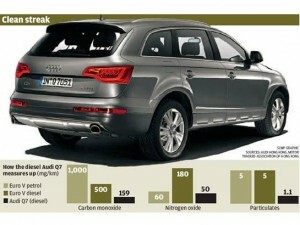 However, they expected only one could meet the emissions standard of a Euro-V petrol car. In September, Volvo said it had created a Euro-V diesel engine as clean as Euro-VI. Bluetec, a green technology for luxury performance vehicles introduced by Mercedes-Benz, meets even the most stringent Californian diesel emissions standard, but the configurations do not match the requirements in Hong Kong. Crown Motors, the dealer for Daihatsu, Lexus and Toyota, is also searching for qualified models, with a sales manager saying the company would try Europe if it failed to find anything in Japan. Edward Lau Che-feng, director of Friends of the Earth, said it was time the public and government adopted an open mind towards diesel cars with the latest emissions-control technology. However, the government should increase the phasing out of outdated diesel vehicles at the same time. “Let us be open-minded … we might fine-tune our strategy, giving more weight to a car’s fuel efficiency and climate-friendliness without significantly compromising air quality,” he said. Dennis Leung Yiu-cheung, a mechanical engineering professor at the University of Hong Kong, believed that the most advanced diesel cars would have minimal additional impact on air quality. “There should be little problem, as most private cars are not used as frequently as diesel buses and trucks,” he said. Diesel-driven cars may soon return to the streets of Hong Kong – and in a much cleaner and environment-friendly form, after being phased out in favour of petrol engines over a decade ago, motor traders say. They have started a global hunt for the right diesel model after the environmental watchdog introduced what they called an “improved flexibility in vehicle emissions standards” last month. The new standard has led to some enthusiasm among the traders badly hit by the economic downturn as they expect diesel vehicles to be popular among cost-conscious drivers who will benefit from diesel prices lower than petrol. The traders said diesel engines were also a third more fuel-efficient than petrol ones, emitted less carbon dioxide, were more durable and could generate greater power. The Environmental Protection Department (EPD) recently rejected suggestions from the Hong Kong Motor Traders Association that Euro V emissions standards be adopted for diesel cars to facilitate imports, as diesel standards still lagged behind those for petrol cars. But the department has since dropped its insistence that imported diesel cars meet the latest Californian standards and associated testing procedures – adopted in Hong Kong in 2006 – which motor traders have said were “virtually unattainable”. And it has said it is also prepared to accept diesel cars which meet or surpass Euro V emissions standards for petrol cars. The same applies to diesel cars which meet the Japanese emissions standard for 2009. The department has become more flexible in its requirements because the Euro V petrol car standards, with tightened curbs on nitrogen oxide emissions and new limits on particulate matter, have become broadly equivalent to Californian standards. “It is still a very difficult task for us to find a diesel car that matches the standard of a petrol car, but there is a chance now at least that we can find something as we are now talking about configurations of European and Japanese vehicles, not the American ones which are totally different from ours,” Michael Lee, chairman of the Hong Kong Motor Traders Association, said. Diesel engines have in the past been unwelcome because of their pollution potential – smoky emissions with high levels of particulate matter known as a major health risk. Diesel engines also generated high levels of smog-inducing nitrogen oxides. To discourage their use, the government adopted the most stringent Californian standards from 1998 and now imposes vehicle licence fees on diesel vehicles up to 37 per cent higher than on petrol ones. But Hong Kong Automobile Association vice-president James Kong Yat-hung said the lower running cost of diesel cars would be attractive as the economy worsened. “It’s not only that diesel is cheaper than petrol, but diesel engines are also about 30 per cent more energy-efficient and durable than petrol engines,” he said. Diesel fuel costs HK$8.07 a litre, which is 38 per cent cheaper than petrol. Since late 2007, the government has also cut tax on diesel by half to 56 cents a litre. The EPD has said it would consider offering a tax concession on clean-running diesel cars – similar to that now offered to high-achieving petrol cars for outstanding environmental performance. The petrol-car concession is a 30 per cent cut in first-registration tax, or up to HK$50,000, if the vehicle emits half the emissions allowed under Euro IV standards and is 40 per cent more fuel-efficient than other cars of the same weight. Tax breaks offered to buyers of environmentally friendly vehicles in an effort to improve air quality have failed, Environmental Protection Department figures show. In fact, the value of tax discounts given under one scheme is just 15 per cent of what the government forecast when it was launched in April last year. That scheme allows buyers of commercial vehicles to save between 30 and 100 per cent of first registration tax if they bought various classes of goods vehicles, taxis, light buses or non-franchised buses that meet the Euro V emissions standards. Just 196 vehicles have been registered under the scheme, representing tax forgone by the government of HK$4 million, as opposed to the HK$26 million annual budget for the programme. There are more than 150,000 commercial vehicles registered in the city. It was the third such scheme put in place since Chief Executive Donald Tsang Yam-kuen promised to reduce emissions in his October 2006 policy address. The first, which began in April 2007, offered cash grants of between HK$17,000 and HK$173,000 to people who replaced their old commercial vehicles with new, more fuel-efficient ones. Of the HK$3.2 billion committed to that initiative, just HK$451 million has been granted for 10,763 applications. There were 74,367 vehicles eligible for that grant. The second scheme targeted petrol-powered private cars. It offered a 30 per cent reduction in first registration tax, up to HK$50,000, if people bought environmentally friendly cars. With 420,729 private cars on the roads, just 6,763 applications have been approved. The cost of the scheme was about HK$160 million. Even the government was not interested in its own green tax-break scheme, with just 600 environmentally friendly vehicles among its fleet of 5,236. Friends of the Earth environmental affairs officer Angus Wong Chung-yin said the schemes were failing because they offered only “carrots” and no “sticks”. As a result, there was nothing to encourage vehicle owners to scrap their polluting vehicles. “That explains why the response has been low,” he said. On the commercial vehicle replacement scheme, Mr Wong said that although owners were encouraged to choose low-emission and fuel-efficient models, there was no requirement to take the old ones off the road. So while newer and cleaner vehicles were hitting the road, their old, smoke-belching predecessors were going into the second-hand market, remaining on the road and continuing to pollute. An Environment Bureau spokeswoman tried to put a positive spin on the figures, noting that the response to the private car initiative had been encouraging. “These environment-friendly petrol private cars account for 11 per cent of all newly registered private cars since the introduction of the scheme,” she said. She blamed the limited availability of Euro V emission-standard commercial vehicles for the low response to the third scheme. Mr Wong said the government should set a deadline for the phasing out of pre-Euro and Euro I vehicles, and designate low-emission zones where heavily polluting vehicles would be denied access.